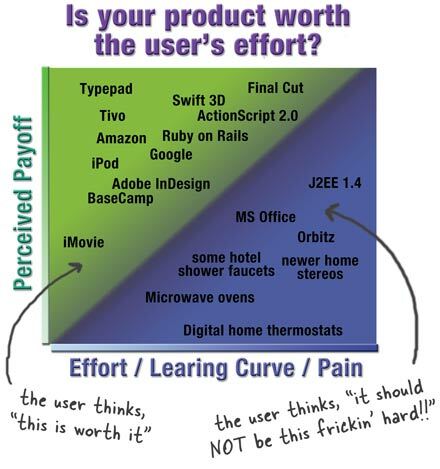 Creating Passionate Users: How much control should our users have? Lovely piece, as always. Now what's the matter with Orbitz? I really like this topic. I recently wrote an post about it. People seem to get really argumentative when you try to take things away. Yet it works so well for the companies you describe - 37Signals, Apple, etc. Sometimes I read the Basecamp customer forum, where people clamor for new features, just to watch Jason Fried and the 37s team shoot them down. Great post as usual, Kathy. It's interesting to see you present the opposite perspective and I tend to agree with you. Giving users more options than they know what to do with is a good way of ensuring they stay away from your product as much as possible. Diana: I can't tell if you're kidding or not... ; ) The problem with Orbitz (and Travelocity, etc.) is that -- bless their little flight-booking-hearts -- they leave you feeling that it shouldn't be THIS frustrating or confusing. There are so many places where the pain doesn't seem worth the payoff, but then you don't really have an option ("I HAVE to book this flight"), which is more frustrating. I just keep running into problems like booking a multi-leg trip and not always being clear about which leg you're picking seats for, etc. -- (something that really matters when one leg is 11 hours long and the other one hour... I care a lot more about the 11 hour...) So, it's not that they're doing a trivial thing, it's just that my perception is that it shouldn't be this frustrating -- it should be pretty brainless. Chas: Agreed, although in some cases I'd rather see things *hidden* as opposed to taken away. I'm definitely FOR advanced things, but not before the user is ready. Featuritis is interesting... I think of featuritis as *quantity* of features -- too much breadth, but sometimes you do need more *depth* on the features you have, so that users can continue to do more advanced things. So, sometimes it might be better to either hide things -- or bump them into a more advanced edition -- rather than completely take them away. Natasha: I do think it IS good to give users a great deal of control--especially in an advanced edition of a product--but again, only when they're ready and know what to do with it (and aren't overwhelmed). As for letting them design the thing, whoa. There are exceptions, of course, but I still think this is most likely to lead to Frankenproducts. It's tricky -- but to me, the most user-centric view is the one that does the best WE know how to do on behalf of our users, whether it's what they'd choose or come up with or not. That sounds a bit like "producer knows best", but in many cases, that's exactly right. The problem is, this is a two-way relationship... if we're not listening to our users, we can't possibly know how to apply our specialized knowledge to help them solve a problem or do something amazing. So, we have to pay very close attention to what they want and need, but innovation and implementation is usually best left to *us*. (And there are plenty of studies that show that what users *say* (and potentially believe) they want and what they REALLY want are more often than not *different* and potentially in conflict! We have to listen to our users, but trust in ourselves and other professionals and research in our field. "It turns out that freedom - the ability to make up your mind and change your mind - is the friend to natural happiness, cuz it allows you to choose among all those delicious futures, and find the one that you would most enjoy. But freedom to choose - to change and make up your mind - is the enemy of synthetic happiness." -Dan Gilbert in his hilarious TED talk (Google Video). He stands up for synthetic happiness: "Synthetic happiness is every bit as real and enduring as the kind of happiness you stumble upon when you get exactly what you were aiming for." And he discusses different ways of generating synthetic happiness. One of which is 'being stuck'. Apparently, whatever you are 'stuck' with, you seem to be happier with (I wonder how this relates to windows advocates, cough cough). He gives this example, "This is the difference between dating and marriage right? I mean, you go out on a date with a guy and he picks his nose - you don't go out on another date. You're married to a guy and he picks his nose - uh yeah, he has a heart of gold, don't touch the fruitcake.... You find a way to be happy with what's happened." Do you think that using synthetic happiness principles can be used to help users without betraying trust? LOVED your graphics, though you'll need to move the DirecTV version of TiVo more to the right. Just got an upgrade on my receiver, and both the remote and the "online" experience have gone from simple to COMPLEX. Lots more capabilities, but also very challenging for those who formerly could run the thing blindfolded. Meanwhile, Sony has an "Easy" button on its new Handycams, so if you don't want to mess with all the controls, you don't have to. THAT was a smart upgrade. Another way to help users through the Canyon of Pain (I chuckled when I saw it, as I've been through it with a number of tech items over the years) is to hold the users hands better, explain what options mean and what the consequences of the options are. I've seen too many check-box panels on things like my graphics cards with options like "Turn off Z-buffer" and no explanation of whether I'd want to do this or not. I'm not stupid, it's just in the last 5 years, technology has accelerated beyond my ability to keep up while still maintaining a job, relationship and life all at the same time. And now I've let it get past me, there's no way to catch up, as every explanation I find online relies on terms rooted in last year tech, which I also don't understand. I learned to eat pastrami sandwiches when I was in college. I would go and stand in line a Koch's Deli to order a pastrami sandwich. The line was long, because so many other people wanted sandwiches, and Koch's knew how to make sandwiches. While we were waiting the butchers would trim off a half pound of cheese or cold cuts and pass them around for the customers to sample. When you finally got to the front of the line (it would take up to an hour, maybe you would need to order something extra to go), you would say, "Pastrami sandwich," and a few minutes later you would presented with an excellent pastrami sandwich. You could say, "Pastrami sandwich with Russian dressing," or some such, but if you didn't you got a great sandwich. And a pickle! Sadly, no one knows how to make pastrami sandwiches anymore. If you go into a deli and order a pastrami sandwich, you basically have to make the sandwich yourself. "What kind of bread do you want that on?" "Do you want it toasted?" "Tomatoes? Onions? Mustard or mayonnaise?" "We have Swiss, Provolone and Jack cheese." "Chips, slaw or potato salad?" "Do you want a pickle?" I would pay extra to be served a good sandwich without the interrogation. Don't the people in the deli know their product better than I do? One minor point here - Final Cut appeals to two very different markets. One is the "used iMovie, want more" market, and you're dead right about them. The other one, and I suspect the larger one, is the pro filmmaker market (of which I'm one). For them, there's very, very little pain associated with the transition to Final Cut Pro. The day we bought a Mac and moved to FCP from Premiere 6 was one of the happiest days I've seen in the office - just me and our editor with a laptop and a pile of FCP manuals, going "ooh! Ohh, look, the "Ripple Delete" function works properly! Ooh, let's play with colour balancing!" Which, of course, explains why FCP (and FCE) is so complex. Both of those programs are also aimed (primarily aimed, maybe) at experienced editors from other packages, and for them the feature increase *needs* to be that steep. I bought a condo in the canyon of pain. Great post as usual. And toilet paper is the worst thing to shop for in the store. There are so many choices, and they are all packaged differently. There are single roles, double roles, mega roles, and more. The number of sheets per roll vary by brand, and the number of rolls in a package vary. It is impossible to find the best value. Impossible. I just get the Scott's 1000, which is, ahem, crappy paper, but I'm pretty sure it's the cheapest. What's worse is if my wife goes to the store I tend to worry that she didn't get the best value. I think I'm neurotic. Interesting! But I had to read it twice. On the first pass I was thinking of myself only as a user/customer who loves control and sees no diminishing return whatsoever to having as much of it as possible. But from my perspective as a provider of professional services, I get it, and in fact designed my business model around not! giving user/clients control (of the process). So I'm asking myself: why do I skirt around "its best that I drive"? After all, I'm motivated by my belief that this is the best way to provide a great customer experience. Maybe its time to put it out there with clients. In any case, I thinks its is a good place to walk a mile in the other's shoes. Thanks for the great post! I think we're still all a little too poor at user interface, usability and accessibility to really turn our sites over completely to our users. And, right now, it's so unexpected that I don't think you can justify the means yet. Let the groundbreaking types do this and push it and we can all catch up when they've worked it out. The idea that too much choice can be dangerous or stressful reminds me of the notion Alvin Toffler puts forward in his book – Future Shock. If asked I believe most users would rather have fewer, easier to use and reliable features than an excess of complicated and unreliable one. As a consumer I’d love to see product that while giving me the base features also meets my additional, and less common requirements. I don’t want everyones features, just those that relate to me. Actually, the bunny slope does have the passionate boarders, but they are focussed on getting to the black diamond. And when they get to the black diamond slope for the first time and get to the bottom with their heart in their throats they have a choice: repeat 'cause it was fun but scary, or retreat for awhile to the intermediate slopes to build up more skills. The intermediate slopes must be there to allow for the transition from beginner to expert- and that applies as much to software as it does to snowboarding. Keeping a passionate user requires the ability to make transitions in both directions and have noticable successes at all levels. I like Ray Baxter's comment above about pastrami sandwiches. It's nice to have options, but I shouldn't be _required_ to make selections for which there are sensible (and delicious!) defaults. The question of whether to _allow_ the user to choose is different from the question of whether to _require_ the user to choose. Wonderful post! I am glad to see that I am not the only one who is tired of "choice". And speaking of DirectTV, I have never been happier since terminating my service and not having to scroll through channel after channel of junk, wasting my time of "supposed relaxation" in a state of quandry. I've found much more enjoyment in my one fuzzy station I can manage to pull off my little antenna (either CBS or NBC depending on atmospheric conditions), and if the channel you get happens to be the one you would prefer that night......sheer bliss. "The sad thing is, I'm probably just two button-presses away from success, but I swear the possible combinations of button-presses on my remote exceeds the number of particles in the known universe." It does! The number of permutations is a function of the number of buttons on the remote and how many presses are required in the sequence. Assuming you don't press any one button more than once, the formula is: buttons! / (buttons - sequence)! The low-end of the estimated number of particles in the universe is 10^72, which is [chuckle] _astronomically_ large. But the amazing thing is that if your remote has 60 buttons, a sequence as short as 47 presses would yield more possible permutations than particles in the known universe (thank you, Ruby!). Luckily, most products aren't that bad, but you can see just how close the lunatic fringe is! Phenomenal piece. Love the diagrams & artwork! Fear teh canyon of pain. How about taking the whole 'level up' concept of games and apply it to business applications. 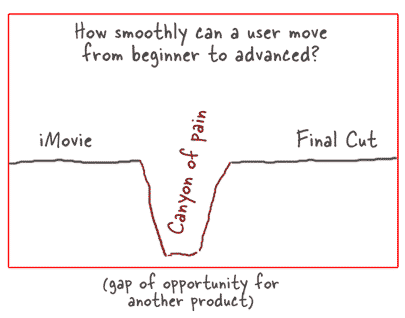 You start in the 'noob' ground and make you're way (slowly, gradulately) up to advanced user. So that you create a lot of 'omg this rocks' moments as a user moves up the complexity chain.